Eurotech office chairs are ready for the demands of the modern workplace. This industry leading manufacturer takes pride in crafting cost effective seating solutions that don't lack in terms of quality. The 8011 Dakota series side chair by Eurotech Seating is perfect for lounge, lobby, and office reception areas. This comfortable guest chair is available in 4 popular color options. 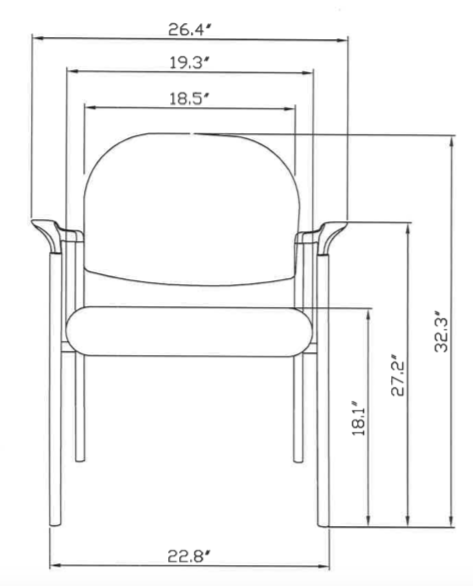 Seat Height - 18.1 "
Eurotech Seating specializes in the provision of high quality office chairs designed with the end user in mind. Eurotech chairs are backed by a factory warranty that ensures a lifetime of performance. The reliable seating solutions from this reputable brand come equipped with the ergonomic features needed to help users compute healthy and work efficiently. Eurotech chairs typically ship from the factory within 1 business day. Custom fabric upholstery options are available on select models. 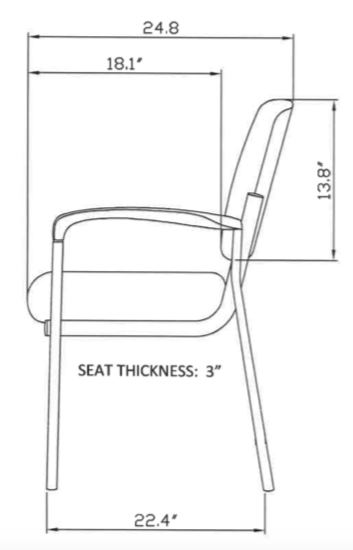 For all products except for 24/7 chairs (see below), Eurotech warrants to the original purchaser all components for the life of the product with the exception of upholstery and foam, which will be warranted for five years. For 24/7 series chairs, Eurotch warrants to the original purchaser a 5 year warranty with the exception of upholstery and foam which will be warranted for 2 years. Eurotech warrants to the original purchaser that all parts will be free from material defects. Eurotech will repair or replace, at its option, any unaltered components. Eurotech does not warrant any aftermarket hardware that is installed on the product. Eurotech's warranty is limited to the normal use of the product in a forty hour work week and a 275 lb. weight unless otherwise noted. Eurotech shall NOT be liable for consequential or incidental damage arising from any product defect. Eurotech's warranty is limited to replacement or repair and does not cover cost of transportation and labor. There are no other warranties expressed or implied other than those specifically described. Proof of purchase is required to validate this warranty. Eurotech does not warrant customer's own material (COM). Eurotech guarantees to stay ahead of your needs by inventorying over 60,000 chairs at all times. Eurotech will guarantee to ship in-stock chairs within 1 business day so long as the order is received during normal business hours of 9 a.m. to 5 p.m. EST Monday - Friday, excluding holidays. Non shipments due to inclement weather are not covered under this policy. Custom upholstered chairs may incur longer lead times. Eurotech offers 32 select models on the Fabrix upholstery program. 215 color options are available. The estimated lead time for Fabrix chairs is 7 working days. All grade 3 fabrics are durable, and easy to maintenance. Anti-microbial and anti-bacterial upholstery options are available on the Fabrix program. All Eurotech products have be certified by GREENGUARD as meeting the Indoor Air Quality pollutant guidelines and standards. The GREENGUARD Environmental Institute is an industry-independent, non-profit organization that oversees the GREENGUARD Certification Program (SM), which certifies indoor products based on strict chemical emissions criteria. Eurotech chairs are tested and verified to meet the GREENGUARD Indoor Air Certification requirements. GREENGUARD Certification provides third-party assurance that products have been tested for potentially harmful chemical emissions, and found to meet the allowable levels established by recognized public health authorities. Since 1979, the Raynor Group has represented quality and unsurpassed customer service in office seating under the Eurotech name. The Raynor Groupstarted as a marketing organization for leading office seating manufacturers. Today, Eurotech is responsible for manufacturing, marketing, sales, and distribution for a select group of office seating products that are manufactured and sold worldwide. Eurotch is committed to the highest standards of quality, accountability and service. The company's product line of office seating is closed based on excellence in design, durability and ergonomic efficiency. The company's diversified distribution channels ensure that no matter how large the order or remote the location, you will experience the fastest and most efficient order fulfillment in the industry. Eurotech Focused on a limited number of retail customers in order to provide customized solutions that completely meet your needs. With cumulative sales of over $1 billion, Eurotech is one of the most successful manufacturing, marketing and distribution companies in the United States.